How can you save your church? Find out with guest Eric Barger on the show Christ in Prophecy. Last aired on August 7, 2011. Dr. Reagan: Are you feeling increasingly uncomfortable with your church due to doctrinal drift that is resulting from a lack of preaching and teaching that is firmly based on the Word of God? Well if so don’t feel like the Lone Ranger because the trend in Christendom today toward a doctrineless Christianity is epidemic. What can be done about it? And more specifically what can you do? Stay tuned as we talk with one of Christendom’s foremost authorities on spiritual apostasy. Dr. Reagan: Greetings in the name of Jesus our blessed hope and welcome to Christ in Prophecy. Once again this week we have as our special guest Eric Barger Founder and Director of an apologetics ministry called, Take a Stand! Welcome back Eric. Dr. Reagan: We really appreciate you coming back for a second week. Eric Barger: I’m just glad to be with you. Dr. Reagan: And also again this week I have my colleague Nathan Jones here to assist me with interviewing Eric. Glad to have you back also Nathan. Nathan Jones: It’s a pleasure, thank you sir. Dr. Reagan: You know Eric I want to begin our discussion this week by having you talk a little bit about doctrine. Now the reason I am raising this is because it seems to me that more and more the attitude among professing Christians today is that either doctrine is irrelevant because all we need to do is just love Jesus. Or doctrine is really to be avoided because it is an obstacle to Christian unity. What about it? Eric Barger: We see doctrine all through the Bible. When the Bible teaches a theme, teaches something to us again and again we develop it and it has been developed over the years into doctrine. Doctrine is not a dirty word. But it has become a dirty word in some circles. Eric Barger: A lot of pastors have elected to not preach doctrine, especially stuff on like eschatology and things that they believe are some how hard to understand. And so we see doctrine being left behind. I am big on the central or essential doctrines of the faith; the virgin birth, the blood atonement, salvation by grace, the inerrancy of the Scripture, the Trinity, and the deity of Jesus. You know the essentials of the faith that have held us together for 2,000 years. Those are the things that will hold us together in times of trouble and distress in the world. And that’s what we need to be preaching, that is the job of the Church. But instead I believe many churches and many maybe haven’t thought it through have decided to preach the latest plan that man has come up with, the latest book, the latest workbook, the latest new DVD series. And all of that is fine, stuff about marriage, and plans about how to handle your finances are wonderful, but those things don’t equate to the Gospel. We need the solid doctrines of the faith to be taught to us faithfully. And you know a lot of Christians say, “I already heard that I don’t need to hear it again.” We need to hear it over and over and over. I need to hear it, all of us here, the camera people, all the crew, we all do, everybody watching we need to hear the doctrines of the faith taught to us. Dr. Reagan: Well if we don’t we end up with what we have in Christendom today and that is ignorance in the pew; the average Christian today simply couldn’t give you the scriptural basis for the Trinity, or for the deity of Jesus, or the virgin birth, or whatever, you know. Dr. Reagan: There is just a famine of the Word and an ignorance of the fundamentals of the faith. Eric Barger: And the Scripture teaches that there will be a famine of the Word too in the book of Amos. But even as much as that, it all leads us to what we see happening in our churches which is really the apostasy of the end times. If we don’t know what we believe and it has not been ingrained in our thinking as this is what Christianity is, then we will begin to believe all kinds of things. And not believe, or want to discount the central doctrines of the faith. And you know something; sounds like a broken record every time I say it, but it all come back to the respect that we hold the Bible in. The honor that we hold the Bible to, it is the most important thing that we can learn. Dr. Reagan: I have a friend in Lexington, Kentucky named Jean Eason and Jean was like a fourth generation Jehovah’s Witness. Eric Barger: I know Jean. Dr. Reagan: Well Jean was the world’s champion in distributing the Watch Tower, no matter how many she distributed they said she needed to distribute more in order to be saved. Eric Barger: Yeah the cults teach their people. You know more people convert from being a Baptist to a Mormon then any other religious group. I mean that says something to us, and I believe this is all because our foundation is weak. If there is anything, when I go to a pastors conference and preach one of the things that I preach about is coming back to the basics and teaching those basics to our people and being faithful with what the Word of God teaches us. I am not accountable for all the plans that men make and concoct around me, or the church growth movement. But I am accountable to what the Word of God says. Nathan Jones: Well why do the churches feel that they can’t teach doctrine anymore? I mean how is it hurting them? Is it hurting their numbers? Do they feel like they are going to be too inclusive and they are not going to be going out into the world? I mean what is stopping them from teaching it? Eric Barger: Some of those doctrines are pretty uncomfortable. Nathan Jones: Hamartiology; sin right? Eric Barger: You know when you start talking sin, and you start talking about repentance and you start talking about the judgments of God and so on, I mean that is tough stuff and that goes counter to the modern church growth movement that says, “Here follow our plan, you will fill your church, you will have a successful church, you’ll be happy ever after.” And that is not what the Scripture says. Nathan Jones: Churches then have moved saying that sound doctrine and growing Christians is more important, and then they said just get numbers and filling the pews is more important. Eric Barger: Yeah, exactly. And doctrine itself, that very word, let alone what it stands for. Nathan Jones: Most people don’t even know what the word doctrine. I mean you say doctrine and they have no idea what even the word doctrine means. Eric Barger: I believe we find that idea or even the phrase that deals with doctrine about 50 times in the Scriptures. Eric Barger: It is pretty important stuff. Dr. Reagan: Well you know doctrine can have a tremendous impact upon, on your faith and how you live. For example I grew up in a church that said we were saved by baptism. Now that is a doctrine, okay so every time somebody sinned what did they do? They went and got baptized again, and baptized again, and baptized again trying to work their way to Heaven instead of relying upon the grace of God, because they didn’t know anything about grace. I thought of grace was a blue eyed blond. Eric Barger: Can I speak, can I speak to that? Not to the blue eyed blond. You know we can’t add to or subtract from our salvation, we either are or we aren’t. I will never forget hearing Walter Martin who was a mentor to me, make the statement, “That you are either saved or you are not. It is like being pregnant, there is no such thing as being a little bit pregnant.” He made a great point and it was true, and once we get that to our people in such a way that they can understand it, and they get it then they can go on and do what God has called them to do, they walk their Christian life out. So often we see people that are confused about works and that is one of the things, if we just think we are good enough. Nathan Jones: That is the more popular one. Dr. Reagan: Our very view of God can have a tremendous impact upon our faith and the way we live. Eric Barger: Sure can, sure can. And we need to see Him as a loving Father that wants to give us good things. The Scripture teaches clearly in Jeremiah and so many other places, He wants to. But He is also a God who is going to judge sin. He is going to judge sin and He gave us a way out, Jesus when Jesus came and died on the cross He gave us the way out. Dr. Reagan: That’s right. Again I grew up in a church that taught me that there wasn’t one verse in the Bible that even implies that Jesus will ever put His feet on this earth again. That we shouldn’t think about it, that we shouldn’t worry about it is all in God’s hands, don’t be the least bit concerned about it. It is amazing I ended up as a Bible prophecy teacher. But my whole life was transformed when I suddenly realized that Jesus is coming back. He is coming back to this earth and He can come back at any moment. If you could ever convince a Christian that number one that Jesus is coming back, and number two it can occur at any moment it will have a purifying effect upon their lives, and also motivate them to evangelism. Nathan Jones: Eric what do you tell churches? This is a big thing right now especially with the post-modern; that idea that the church has been to inclusive it needs to get out into the world. But a lot of churches are hurting because they want their churches to be out in the communities they want to do missions what do you tell them that it is okay to teach doctrine, that it won’t hurt that movement towards missions? Eric Barger: You meant too exclusive, and they want to be more inclusive. I understand what you are saying. Nathan Jones: Yes, I am sorry. Eric Barger: I knew what you meant and I wanted to clarify so folks would understand. Eric Barger: I think again the most important thing is to reexamine what we are based on. Go back and look at what we are, who we are as Christians. And you begin to teach those things rather than all these other things that are being called Christian around us. I’ve got a couple facts I think will really illustrate this because I think that folks are saying, “Oh, it can’t be really that bad.” Well, let me just read from my seminar outline this is from our DVD, “Discernment or Deception Which Will you Choose?” And I quote the Pew Forum which is a very widely known polling source. Eric Barger: Yes, this is the environmental movement. Nathan Jones: This is the movie, Avatar. Eric Barger: “23% of Christians say they believe in spiritual energy in trees.” I mean this is, if you don’t think we need doctrine taught this illustrates how desperately we need it. Nathan Jones: Welcome back to our discussion with Eric Barger about the importance of Christian doctrine. Eric I have a question for you, could you tell us some historical examples of doctrinal drift? How does it happen, and how has it happened in history? Eric Barger: I didn’t know we had 3 hours Nathan. Nathan Jones: I’m sure you have a few though right? Eric Barger: The very Reformation was about coming back to pure doctrine. Dr. Reagan: 150 years ago England was the center of world Christianity sending out missionaries all over the world, translating the Bible, most of the hymns that we have in our books are written by their pastors, and today 7% of the people in England go to church and most of those are apostate churches. Eric Barger: Yeah, that is exactly right. Dr. Reagan: The seminary I went to, Southern Seminary is a great example of a return back to the faith. I wasn’t there in the 70’s but supposedly their doctrine had gone really bad, and when I was there were some of best doctrinally sound churches because of revitalization that Al Mohler brought into it. Dr. Reagan: Or consider speaking of schools; consider Harvard, Yale and Princeton, all of which were founded as Christian Universities. In fact you go back and look at the founding documents and they say the purpose of this university is to bring people to Jesus Christ. Dr. Reagan: And prepare people to go out and share the Gospel. And today they are pagan, secular universities. Eric Barger: They really are. That was, see those were the standards for theological institutions in America and we all see what has happened there. So if anybody thinks it couldn’t happen to you and your church, or your denomination, it can. Dr. Reagan: And it can happen fast. Nathan Jones: How does it happen, what causes this drift away from? How can you teach the Bible, and teach doctrine and one day you are not? Eric Barger: Well if leaders are not holding the Word of God up and with authority, believing and teaching it faithfully, then those who listen to them will do the same. Nathan Jones: So it is the leaders then that are dropping the ball. Eric Barger: There is a progression that took place I believe; first it happened in the leadership of the denominations, and then into the pulpits, and then into the pews. 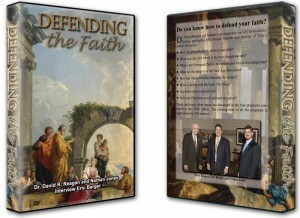 Dr. Reagan: Well how can a Christian be discerning about doctrine? Eric Barger: This should be I mean that should stand out with red lights all over as we read it in His Word. “Watch out that you are not deceived.” Paul warns his followers of the same thing to look out that we are not deceived. And so once again it is holding up the Bible and looking at what is being called Christian, let alone what the world is accepting to see if it matches what the Scriptures say. And I always tell people test me and everybody else that comes along, every word. Dr. Reagan: All of us, I mean Paul complemented the Berean’s on testing him and he was an apostle. Eric Barger: That’s right, that’s right. And he says in Galatians 1, “If an angel from Heaven or me should come back to you and preach something different then what I’ve already taught don’t believe it.” He was saying what I have already taught you is the truth and it’s not going to change, test everything by it. Dr. Reagan: Basically what you are saying is if you are going to be discerning you’ve got to know the Word. And that is the problem today. Eric Barger: Got to know the Word. Dr. Reagan: You’ve got to know the Word. Eric Barger: And our teachers, our leaders, our theologians, our pastors, we need people in those places, in those positions who revere and respect the Word and hold it to the highest regard imaginable. Nathan Jones: Should Christians, because I have people write in saying that they have seen their church, they have been there 20 or 30 years go from a solid doctrinal church to just teaching fluff and butter, and they want to know show they stay there and be a light to that church or should they leave? Dr. Reagan: That is a good question, Nathan. Eric Barger: That is a great question. Nathan Jones: How do you answer that? 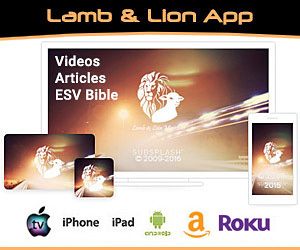 Eric Barger: I have a message called, Divorce from Church: How Apostasy Scatters the Sheep, and we have it on DVD and I deal with that in it. And one of the things I say is listen if you really believe you can bring theological reform in your church, then stay try to bring reform. However if you have young children or others who are being effected in a wrong way by what it being taught there, or not being effected in their spiritual life correctly then you have a responsibility first and foremost to lead your family in the things of God. But now there are a lot of people in that shape, I get e-mails, I’ve got a stack of e-mails that deal with this, we’ve had hundreds of them. People who have written and said, “Our church used to believe and now we don’t.” Or, “I feel…” I had a call yesterday from a fellow who was a theologian, an earned doctorate Bible Teacher teaching in a theological institution one that I am acquainted with and he was put out basically he said, “I am in exile from my denomination because I’ve had made a stand on the Word of God and they decided not to follow it.” And if I named it was one of the great evangelical denominations that were known for their standard of holding onto the Word of God. Dr. Reagan: What is the difference Eric between tolerating differences of opinion, and tolerating false doctrine, because I may disagree with you on some aspect of Bible prophecy? Dr. Reagan: Or something of that nature, how often should we take communion and that sort of thing. But those are matters of opinion aren’t they? Eric Barger: They are, and there are some things I call them peripheral doctrines; they are around the edge. There are things we need to have our positions on and they are important but they are not in for example the Apostles’ Creed. It is not a Heaven and Hell or drop dead issue. Eric Barger: It’s not something that we have to believe to be Christians but there are, there are certain doctrines of the faith as we mentioned before; the virgin birth, blood atonement, salvation by grace, deity of Christ, many of those doctrines, those doctrines we have to believe to call ourselves Christians. Now a lot of people, anybody can call themselves a Christian, but those are the things that make up authentic Christianity. Those other issues love to talk about them, don’t want to break fellowship on them with anybody and I think we ought to have our positions, but they aren’t issues that effect my eternity. Dr. Reagan: So it is there core doctrines of the faith. Let’s identify those very clearly now. What would you say are the core doctrines of the faith? Eric Barger: Well I just began, first of all who God is the idea that there is a God who communicated with men. That He sent His Son to die on a cross in substitute for me and for you and for anyone who would believe. That He was deity; He was fully God and Fully man. We see these things outlined in the Apostles’ Creed, and I have a linked on my website at ericbarger.com that folks can go if they have never seen or don’t know it, they can go there and find it, simply by using our search engine they can find the Apostles’ Creed. It is in the back of most of the hymn books too. But it is something that every Christian ought to know that those things are non-negotiable. Dr. Reagan: Yeah, for example with regards to cult’s two things, there are many things that characterize cults but two things in particular; one they always have a distorted view of Jesus, He is never the Son of God, deity in the flesh. Dr. Reagan: He is Michael the Archangel, or whatever. Eric Barger: Or He was a man who became a god. Dr. Reagan: Or second always a characteristic of a cult is that you have to work your way to Heaven. Dr. Reagan: In fact that is one of the things that sets Christianity apart from every other religion in the world. Every other religion can be spelled D-O. Dr. Reagan: Except Christianity it is spelled, D-O-N-E, done. Eric Barger: Have you seen my DVD, The Most Dangerous Cult? We talked about that a couple of times. Dr. Reagan: Well as a matter of fact I have. Eric Barger: Yeah, I know you have. A couple of years ago when we talked about this on the air, but that is one of signs. Dr. Reagan: And that always catches people by surprise. Now what is the most dangerous cult? Is it the Mormon, is it the Jehovah’s Witnesses, is it the Moonies? Eric Barger: No, it’s those who claim to be Christians but don’t believe the Gospel. Nathan Jones: Yeah, works based salvation they creep it right in there. Eric Barger: That’s right the bottom line in the most dangerous cult is that it is always is based on what we can do for God, or the cult, but not what Jesus already did for us. Eric Barger: Yeah. I have talked to pastors who have told my privately, “You know I was in the ministry, I had gone through seminary and some point while I was pastoring such and such church I realized I really don’t know Jesus, I know all about Him, but I don’t know Him as Lord and Savior.” And if anybody watching us is in that shape they need to stop and take pause. Dr. Reagan: Why don’t you just speak to that camera right now and tell what is the difference between knowing Jesus and knowing about Him. Eric Barger: You can know all about Him folks. You can memorize the words in the Bible and you can say sure I know He did this and this and this, and this is what we know about Him. But if you don’t know Him as your Lord and Savior, if you have not personally invited Him into your life and in doing so then turn from the world, and turn from your sin, that is called repentance to follow Him. And say, “Jesus I can’t do it myself I believe in you as Lord and Savior.” If you have never done that no matter how good you are, no matter where you were baptized, or when or how many times, no matter what you think about your own good works none of those things can save you. Only what Jesus did can save us. It’s not about us, it is about Him, and us getting in agreement with what He did for us and what His Word says. Dr. Reagan: Beautifully stated, and Jesus said the essence of salvation is knowing Him, knowing Him and that is what we have to do, get into a personal relationship with Jesus Christ. Nathan Jones: Welcome back to our discussion with Eric Barger about the importance of Christian Doctrine. Eric your ministry has made this video, Discernment or Deception, it is a great video. Can you tell people how they can get it? Eric Barger: Sure, that one and the other one we mentioned, Divorce from Church, and all the rest of our materials are available on our website at ericbarger.com, E-R-I-C-B-A-R-G-E-R.com and if you don’t have internet access you can call our office at 214-289-5244. We also produce bi-weekly e-mail newsletter, and a bi-monthly newsletter and I encourage anybody to get those, they are free of charge. We would love to put you on the list and communicate with you in that way too, and help you have resources on how to defend the faith. Dr. Reagan: What if they have a question about doctrine or something of that nature can they send that into you? Eric Barger: I am hoping they will call you Dave. No. Eric Barger: Most certainly, and we look for good sources to also align with and often times I send folks to your website as well. Dr. Reagan: Plus you have a lot of articles on your website don’t you? So they can use, they don’t necessarily have to write you they can go first and just type into your search engine something about Mormons, or whatever. Eric Barger: Exactly, and that is why we have those there. There are over 1,000 pages on our website, so people can go looking for different topics whether it is something dealing with Christianity or the cults, or the occult, or spiritual warfare and they will probably find something that has already been created that we have on the site. Dr. Reagan: And you also do speaking at churches, don’t you? Eric Barger: Yeah, a couple 100 days a year in churches. Dr. Reagan: Is that all? Eric Barger: Yeah, churches and conferences. Dr. Reagan: So they can contact you through the website about that also. Eric Barger: They can do that or call the phone number and we would love to talk. And to any pastor about this we will go to all different kinds of churches and we want to go and help support a pastor who really wants to make stands. 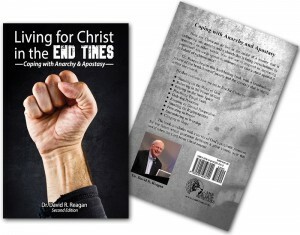 Dr. Reagan: Folks, I have written a book how Christians can cope with two of the greatest challenges of the 21st Century; namely the deterioration of society, and the growing apostasy in the Church. The title of the book is, Living for Christ in the End Times, and this book is divided into three segments; The Descent into Paganism, the Christian Response to a Pagan World, and the victory over paganism. In the descent into paganism I talk about the fact that the two greatest challenges that we as Christians face at the beginning of the 21st Century were; number one the decay of society, and number two the apostasy in the church that we have been talking about. And then in part two, I talk about what we can do to cope with this pagan world that we live in, very much like Daniel living in the world that he lived in when he was in Babylon. And I have chapters entitled, “Standing on the Word of God,” “Believing in the Power of God,” “Relying on the Holy Spirit,” “Practicing Tough Faith,” “Ordering Your Priorities,” “Keeping an Eternal Perspective,” “Standing for Righteousness,” “Persisting in Prayer,” “Surrendering in Worship,” and “Clinging to Hope.” And in the last section the Victory over Paganism I talk about the fact that we are going to win in the end. We are going to win when the Lord Jesus Christ returns. And I talk about the fact that we are living on borrowed time, that Jesus is at the very gates of Heaven waiting for His Father to give the command. All the signs of the times point to the fact that He is coming any moment. I talk about the importance of living looking for the return of Jesus Christ. This book is available for a gift of $15 or more, and all you have to do is call the number you see on the screen there or go to our website at lamblion.com and you can find a way there to order it also. Nathan tell them about some other things they can do on that website like signing up for our magazine. 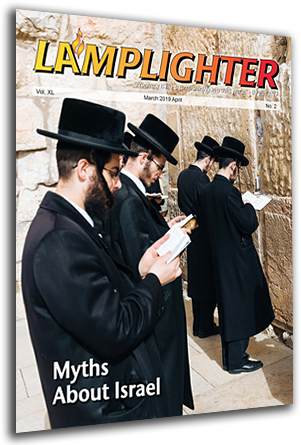 Nathan Jones: You can get the Lamplighter Magazine, either a subscription through our resource center, or you can get it free electronically. 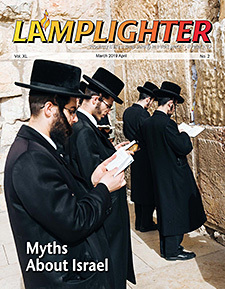 There is a newsletter that comes out once every other week and go to www.lamblion.com and sign up for that. 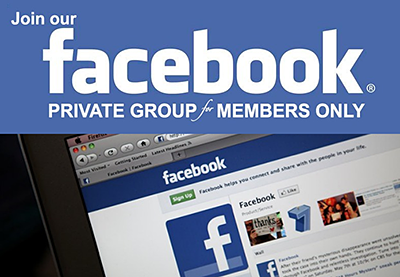 The website is a repository of articles on Bible prophecy and Apologetics, we have TV shows the one you are watching here you can watch on-line as well, and it just a great resource for getting in touch too with other Christians in discussions on the Facebook group and on our blog. Dr. Reagan: And it’s also a good way to pester you with questions. Nathan Jones: Yes, just click contact there will be a form you can fill it out if you have a question send it to me and I will forward it to Eric. Dr. Reagan: Well, Eric as we bring this program to a close today I would like to invite you to come back a third week with us. We enjoy having you so much; we would like to invite you to come back with us for a third week to talk a little bit more about these issues that we are kicking around here. Would you be willing to do that? Eric Barger: Oh, you bet sounds great.